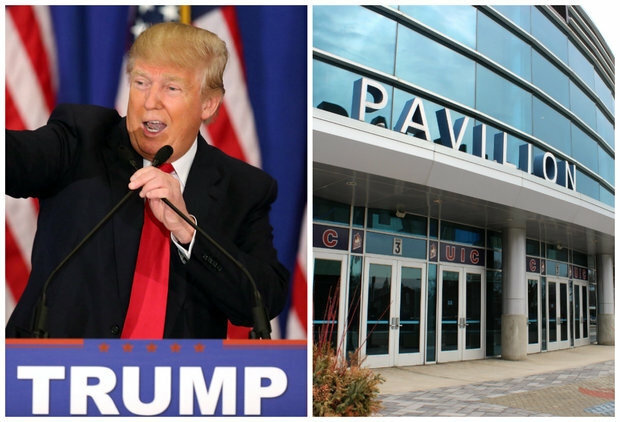 Republican front-runner Donald Trump will host a rally at the UIC Pavilion Friday. CHICAGO — In a rally that will draw thousands, Republican presidential front-runner Donald Trump is expected to take the stage at the University of Illinois at Chicago's Pavilion Friday night. Headed to campus to support the GOP candidate, or want to protest his policies? Here's everything you need to know. How do I get to the UIC Pavilion ? The UIC Pavilion is at 525 S. Racine Ave. at Harrison Street and Racine Avenue in Chicago's University Village neighborhood, just south of the Eisenhower Expy. and west of Downtown. The Harrison Street parking structure will be open for those attending the Trump rally, according to UIC. The Racine Blue Line stop, at 430 S. Racine Ave., is the closest CTA "L" stop to the venue. It is possible that streets near the pavilion will be closed off Friday. Unassembled blue Chicago Police Department traffic barriers were near the pavilion Thursday, but Chicago Department of Transportation referred all questions about traffic to the U.S. Secret Service, which did not return calls this week. UIC staff and faculty who typically park in lots 1A, 1B or the Harrison Street parking structure may relocate to parking Lot 9 or Lot 4 on Friday. There will be no charge to park in an alternative lot Friday. What time does the pavilion open ? Doors open at 3 p.m. for the event, which is scheduled to start at 6 p.m. Many Trump supporters are expected to line up at the gate early. I have a ticket. Does that mean I'll really get in? While the Trump campaign has not answered questions about admission to the rally, Doug Ibendahl, an attorney and editor of Republican News Watch, said Trump has been breaking attendance records at venues across the nation, and he expects the candidate's appearance at UIC to be no different. While some Trump foes plan to register for the event and not show up, because there are no reserved seats, Ibendahl said they are "wasting their time." "You gotta get there early. Thousands of people [won't be able] to get in," he said, whether they registered or not. IDs are not required for entry, the campaign said. According to information sent by the Trump campaign with tickets to the event, no posters, banners or signs will be allowed inside the event. Professional cameras with a detachable lens, tripods, monopods, selfie sticks and GoPros are also banned. Officials did not immediately say whether metal detectors would be used to screen entrants, but they have been used at other Trump rallies across the country. All rally attendees will be required to comply with UIC Pavilion policies, including policies against bringing prohibited items inside and following an event code of conduct. How many will the rally attract? UIC Pavilion can hold up to 10,000, and thousands of protesters could show up near the site Friday, too. As of Thursday night, 10,000 people vowed to show up to protest (though Facebook RSVPs for such events are typically higher than actual turnout). The Police Department expects to have a "very visible presence" at the rally. The UIC Police Department will be responsible for the safety and security of people inside the UIC Pavilion and on UIC property. The Chicago Police Department will be responsible for public safety and traffic control on city streets surround the pavilion, and U.S. Secret Service agents, Illinois State Police and the Chicago Fire Department will also be on site Friday night. Parking lot 1B, at the southeast corner of Harrison Street and Racine Avenue across from the UIC Pavilion, will be open for demonstrations, UIC officials said. A stage will be set up for demonstrators on the west end of the lot near Racine. A number of Latino politicians, including U.S. Rep. Luis Gutierrez (D), Ald. George Cardenas (12th), Ald. Raymond Lopez (15th) and Ald. Gilbert Villegas (36th) said they will stand among the protesters Friday outside the UIC Pavilion. Earlier this week, 180 UIC teachers said the presence of Trump and his supporters at the UIC Pavilion Friday will create a "physically dangerous" environment for students and staff. They urged the event be canceled. Mark Donovan, UIC vice chancellor for administrative services, has urged protesters to engage in a way that is respectful and recognizes a shared belief in the principles of free speech. "We hope and expect any demonstrations outside the pavilion to be peaceful," Donovan wrote. "The fact that this event is happening on our campus in no way threatens UIC’s core values of freedom, equality and social justice for all, regardless of race, religion, national origin, disability status or sexual orientation."